This square end table is the perfect finishing touch to your modern living room. The metal base and exposed bolt head give the piece an industrial look with its resemblance to aged steel. 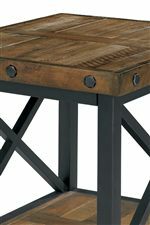 The metal base has an X design on each side while the top features wood planks for a rustic look. Use the bottom shelf to display decor while the top is perfect for a lamp, your latest reading material or whatever you want on display in your home. Sitting on square block legs and constructed from reclaimed wood planks, this quality piece is sturdy. 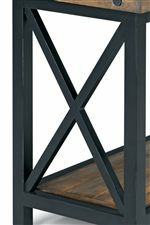 Use this square end table to effortlessly update your living room with an modern industrial look. The Carpenter Square End Table with Wood Plank Top by Flexsteel at AHFA in the area. Product availability may vary. Contact us for the most current availability on this product.